ژرفی, حدیث, اختراعی طوسی, حمید. (1393). تحلیل خزشی دیسک دوار ساخته شده از مواد مدرج تابعی با پروفیل غیریکنواخت. 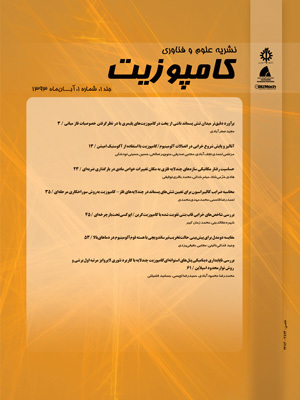 علوم و فناوری کامپوزیت, 1(2), 29-36. حدیث ژرفی; حمید اختراعی طوسی. "تحلیل خزشی دیسک دوار ساخته شده از مواد مدرج تابعی با پروفیل غیریکنواخت". علوم و فناوری کامپوزیت, 1, 2, 1393, 29-36. ژرفی, حدیث, اختراعی طوسی, حمید. (1393). 'تحلیل خزشی دیسک دوار ساخته شده از مواد مدرج تابعی با پروفیل غیریکنواخت', علوم و فناوری کامپوزیت, 1(2), pp. 29-36. ژرفی, حدیث, اختراعی طوسی, حمید. تحلیل خزشی دیسک دوار ساخته شده از مواد مدرج تابعی با پروفیل غیریکنواخت. علوم و فناوری کامپوزیت, 1393; 1(2): 29-36. Abstract Rotating discs are the vital part of many kinds of machineries. Usually they are operating at a relatively high angular velocity and temperature conditions. Accordingly in practice, the creep analysis is an essential necessity in the study of rotating discs. More recently the application of Functionally Graded Materials (FGMs) in the construction of rotating discs is the subject of many researches. These newly developed heterogeneous compounds enable the designer to manage the distribution of material properties and benefit their superior thermo-mechanical capacities. Apart from the patterns of material distribution, the shape of a disc is another factor which controls the stress field and consequently the deformation and life expectations. To study the effects of cross sectional profile, three different Aluminum-Silicon Carbide FGM discs with uniform, convergent and divergent cross section profiles are selected as the case studies. It is seen that there is a definite speed in which creep relaxation reduces considerably at the entirety of the disc. This important rotational speed is named the creep limit speed. Some case studies are represented to show the effects of disc profile upon the disc creep limit speeds. J. Betten, Creep Mechanics, 2nd edition, Springer Press, Berlin Heidelberg, New York, 2005. V. Birman,L. W. Byrd, “Modeling and analysis of functionally graded materials and structures”, Journal of Transaction of the ASME,60, 195-216, 2007. A. M. Wahl, G. O. Sankey, M. J. Manjoine and E. Shoemaker, “Creep test of rotating discs at elevated temperature and comparisons with theory”, Journal of Applied Mechanics, 21, 225-235, 1954. B. M. Ma, “A creep analysis of rotating solid discs”, Journal of the Franklin Institute, 267,157-168, 1959. B. M. Ma, “Creep analysis of rotating solid discs with variable thickness and temperature”, Journal of the Franklin Institute, 270,40-54, 1961. B. M. Ma, “A power-function creep analysis for rotating solid discs having variable thickness and temperature”, Journal of the Franklin Institute, 277,593-612, 1964. V. K. Arya and N. S. Bhatnagar, “Creep analysis of rotating orthotropic discs”, International Journal ofNuclear Engineering and Design, 55, 323-330, 1979. N. S. Bhatnagar, P. S. Kulkarni and V. K. Arya, “Steady state creep of orthotropic rotating discs of variable thickness”, International Journal ofNuclear Engineering and Design, 91, 121-141, 1986. D. D. Deivedi, V. K. Gupta and A. K. Dham, “Investigating the effect of thickness profile of a rotating functionally graded disc on its creep behavior”, Journal of Thermoplastic Composite Materials, 26(4), 461-475, 2011. V. Vandana and S. B. Singh, “Modeling anisotropy and steady state creep in a rotating disc of Al-SiC having varying thickness”, International journal of scientific & engineering research, 2(10), 1-12, 2011. S. B. Singh and S. Ray, “Steady-state creep behavior in an isotropic functionally graded material rotating disc of Al-SiC composite”, Journal of Metallurgical and Materials Transactions, 32A,1679-1685, 2001. S. B. Singh and S. Ray, “Modeling the anisotropy and creep in orthotropic Al-SiC composite rotating disc”, International Journal of Mechanics of Materials, 34(6),363-372, 2002. S. B. Singh and S. Ray, “Newly proposed yield criteria for residual stress and steady state creep in an anisotropic rotating composite disc”, Journal of Materials Processing Technology,143, 623-628, 2003. H. Jahed and J. Bidabady, “An axisymmetric method of creep analysis for primary and secondary creep”, International Journal of Pressure Vessels and Piping, 80, 597-606, 2003. V. K. Gupta, S. B. Singh, H. N. Chandrawat and S. Ray, “Creep behavior of a rotating functionally graded composite disc operating under thermal gradients”, Journal of Metallurgical and Material Transactions, 35A, 1381-1391, 2004. V. Gupta and S. B. Singh, “Mathematical model of creep behavior in an anisotropic rotating disc of Al-SiC with thickness variation in presence of thermal residual stress”, International Journal of Mechanical engineering and technology, 3, 274-283, 2012. Y. Terada and T. Sato, “Relationship between minimum creep rate and rupture life for a Die-Cast Mg-Al-Mn alloy”, Journal of Materials transactions, 49, 439-442, 2008. A. Ghorbanpour Arani, A. A. Mosallaie Barzoki, R. Kolahchi, M. R. Mozdianfard and A. Loghman, “Semi-analytical solution of time-dependent electro-thermo-mechanical creep for radially polarized piezoelectric cylinder”, Journal of Computers and Structures,89, 1494-1502, 2011. V. K. Gupta, S. B. Singh, H. N. Chandrawat and S. Ray, “Steady state creep and material parameters in a rotating disc of Al-SiC composite”, European Journal of Mechanics-A/Solids, 23, 335-344, 2004. V. K. Gupta, V. Kumar, S. Ray, “Modeling creep in a rotating disc with linear and quadratic composition gradient”, International Journal for Computer-Aided Engineering and Software, 26, 400-421, 2009. A. B. Pandey, R. S. Mishra, Y. R. Mahajan, “Steady state creep behavior of silicon carbide particulate reinforced aluminum composites”, Acta Metallurgica et Materialia, 40, 2045-2082, 1992. M. Rattan, N. Chamoli and S. B. Singh, “Creep analysis of an isotropic functionally graded rotating disc”, International Journal of Contemporary Mathematical Sciences, 5, 419-431, 2010.